We're very excited here in the Forest because the first of the fireflies have started to emerge - earlier than usual. Our Firefly Season starts this weekend on Saturday 9th November and we have lots of things happening between now and mid December to celebrate this season. Firefly Magic is a unique festival at the beautiful Australian Rainforest Sanctuary, known locally as the Forest of Tranquility. That enchanting hour between day and night is when creatures of the forest stir from their afternoon slumbers and venture out to play. The Fireflies come out at Dusk and like humidity. However they do vary nightly, so we suggest the evening is deemed an opportunity for a twilight stroll and evening picnic. A torch is recommended - for footsteps - not for viewing. 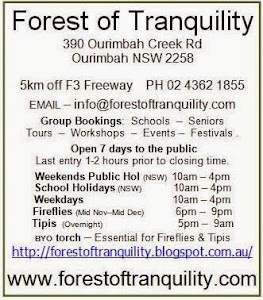 Due to dry conditions and bush fire smoke we have decided to move the Wizard Costume Event and workshops to the closing of the Firefly Season on the 21 December. This will coincide with our Musical Melting Pot weekend 21 and 22 December and Xmas activities on the Sunday. 21 December ~ Wizard - Costume Event and Workshop Details - Park entry from midday on Saturday. $30 per person. Wizard Workshops commence 3pm. Finish 5:30pm. Healing Gongs - Songdahla Sound Bath in the Forest. Wizard Costume Competition - Awards and prizes for originality, aesthetics, creativity and sustainability.